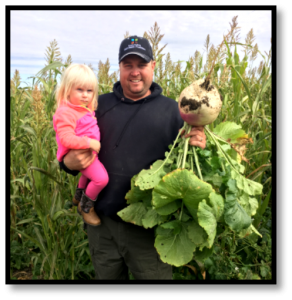 Levi Neuharth, Vice Chairman of the South Dakota Soil Health Coalition, and wife Crystal Neuharth hosted an educational field day at their farm near Fort Pierre on October 4th 2017. Technical personnel and local producers gathered to view full season cover crops which had been implemented with partial funding provided through the Natural Resource Conservation Service’s Conservation Stewardship Program (CSP). Participants learned how Neuharth had integrated livestock in conjunction with full season cover crops in order to increase soil health. Other demonstrations of soil health principles at the event included a rainfall simulator and a session describing how to measure infiltration at field level. Neuharth and his family, farm approximately 2,500 acres of land with an additional 3,000 acres of grassland which is custom grazed. Some of the many soil health practices incorporated into his operation include: utilizing No-Till; diversifying crop rotations to include a wide variety of small grains such as winter wheat, spring wheat, oats, peas, milo, sunflowers, as well as hay barley; incorporating livestock through custom grazing and utilizing rotational grazing; as well as planting cover crops. Neuharth’s were recognized by the Society of Range Management (SRM) for the management excellence. “The Neuharth’s get it! When you step foot on their operation, you can see first hand what great management looks like.” stated April Boltjes, USDA/NRCS Soil Conservationist in Pierre. When asked which of these soil health practices he believes has made the most difference on his farm Neuharth insists that it is impossible to identify just one. He believes that in order to be successful the practices must be utilized together. As someone who grew up with a No-Till background, mimicking nature to the best of his abilities is extremely important to this soil health advocate. In the future Neuharth hopes to continue to learn new soil health techniques, work to limit necessary inputs, as well as incorporate more livestock throughout his operation.